Black voters who factored prominently in the 2017 election that helped Northam become Virginia governor are feeling betrayed over the scandals that have engulfed the state over the past week, leaving them with a less-than-ideal set of choices at the top of the Democratic Party: a governor and attorney general who wore blackface and a lieutenant governor who stands accused by two women of assault. The next person in line for governor is a conservative Republican. Many are struggling to come to grips with a list of nagging questions: Do they forgive the Democrats, keep Republicans out of power and demand the governor get serious about racism? Should Northam step down and hand the office to African-American Lt. Gov. Justin Fairfax, who faces assault allegations? Or should all three of them walk away and let principle prevail, even if the other party takes charge? The governor has been facing calls to resign ever since a photo emerged from his medical school yearbook page in 1984 that showed someone in blackface next to a person wearing a Ku Klux Klan robe. He initially said he was in the photo, then denied that but said he did wear blackface when he impersonated Michael Jackson around the same time. 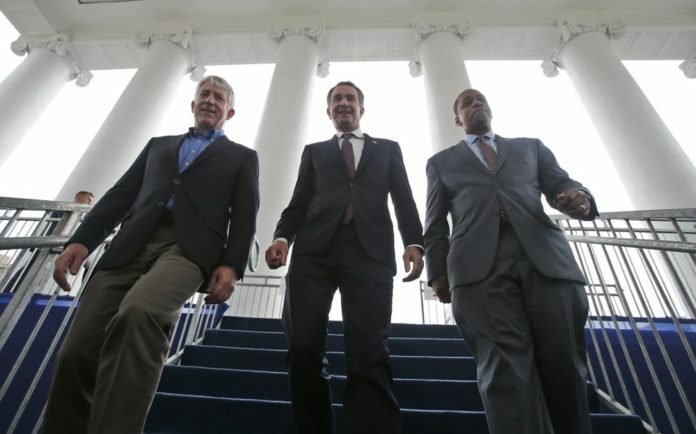 Days later, Fairfax was accused of assaulting a woman in 2004, and Attorney General Mark Herring came forward to admit that he, too, wore blackface in the 1980s. As of Friday night, Northam informed his Cabinet that he was determined to stay in office, Herring remained in a wait-and-see posture, and Fairfax had denied a second accusation of assault, this one from a classmate at Duke University who said he assaulted her in 2000. Northam is vowing to start an honest conversation on race to begin to heal Virginia’s lingering racial legacy. The Black Community and the Secular/non-Observant Jewish Community (which makes up about 80% of the entire Jewish Community) vote overwhelmingly for DemonRAts! One day these 2 groups will wake up and realize that they’re voting Against their own interests. drugcommish in LA, Mashiach will rather come sooner than the second group “will wake up and realize that they’re voting Against their own interests”.